First and foremost as parents, we have a solemn responsibility to raise our children in the “training and admonition of the Lord” (Ephesians 6:4). It is not the responsibility of the preacher, the youth minister, the elders, etc. The responsibility to teach God’s Word lies at the feet of the parents. Preachers, youth ministers and elders are resources to be used to help aid the process, but they are not a substitute for the responsibility God has clearly given to Mom and Dad. In our fast-paced lives, we have many distractions: work, school, extracurricular activities, sports, cell phones, computers, social media and all of our other gadgets. Every time we cut out time from our schedules for each of these activities, God keeps getting a smaller portion of the pie. As a family minister, I see the many issues facing our modern families, and as an aid to those families I, along with our elders, identified one obvious and easy way we could help make God a priority in our families’ homes – Family Devotional Week. Family Devotional Week is a way we can give God a larger portion of our time and, in turn, connect with our families in a meaningful way. Each family in the congregation was provided with all the materials needed for an age-appropriate Bible devotional. All they needed to do was commit to the time that week to gather the family and do the devotional. 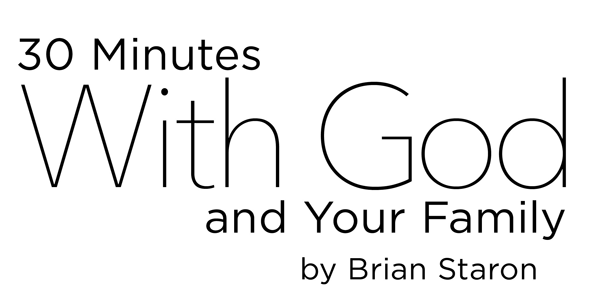 We designed these devotionals to be about 30 minutes each. Obviously, if they want the study to last longer or do it over several nights, that’s even better. We encouraged our families to turn off the cell phones, television, computers, etc., during this time of study so they can fully concentrate on the Word. As we explained to the congregation what the whole week was about, we quickly found a lot of internal support for the program. We even saw families joining together to conduct joint devotionals in their homes, something I am sure every congregation of the Lord’s people would love to see. As an example of one of the week’s devotionals, we found craft kits that go along with the Ephesians 6 outline of the armor of God. We gave these kits to our families with children in sixth grade and below. We asked that as they build the kit (as a family) Mom and Dad really explain what the parts of the armor stand for and not just read the verses. It’s a visual and stimulating way for the younger children to learn these great Bible truths. For grades seven and up (including adults), we designed a series of 10 questions for the young ones to ask their parents. The scenario was that the child was to be a “reporter,” and Mom and Dad were to answer the questions as though they were Jesus. By design, the answers to these questions were not simple “book, chapter and verse” answers. They would require study and knowledge of God’s Word. An example: “Why did you cry when Lazarus died? You knew who you were and what you could do.” The answer would have to include the explanation of Jesus as both human and God at the same time. These questions and answers would create a conversation within the family about the Scripture. What could be better than Mom and Dad talking about God’s Word with their family? (On a side note, these questions, many of them very difficult, caused conversation among members as they were asking each other how they answered them during their family devotional). This list of questions was given to the adults in our congregation who didn’t have children at home so that they too could dig into the Word and find the answers. The Sunday we kicked off the Family Devotional Week, we had special Bible study classes to prepare everyone in the congregation for the week ahead. We had targeted Bible studies with all age groups of the congregation. The K-5th grade group was taught the importance of studying God’s Word and building on the foundation of His Word. Our 6th -12th grades studied the armor of God in Ephesians 6. Many of them had younger siblings who would be studying that lesson at home that week. We wanted to prepare the older kids so they could be of help in the family devotional on the subject. Our adults studied the list of interview questions that they would be asked in order to prepare themselves for their discussions on those subjects with their families. Everyone left the building with a firm grasp on the material they would be discussing as a family that week. Then things took off. As we were developing the program and working on execution, I talked to several colleagues for their input. One thing was very clear after talking to them – we were onto something. Each one asked for the material so that they could do the same thing in their congregations. Within two weeks of concept, the program was a reality and hit social media. I started receiving emails from congregations around the country wanting the material as well as the mechanics of what we were doing. Over 40 congregations in 11 states were part of the first Family Devotional Week, which was May 17-23. Every member of these congregations was encouraged to know that thousands of other Christians that week were doing the same devotionals and taking time to pray and study God’s Word as a family. Brian Staron is the family minister for the Church of Christ in Richmond, Ky. He can be reached at brianstaron@msn.com. To subscribe to Gospel Advocate, click here or call 1-800-251-8446.